The Royal Moroccan Navy has taken delivery of a Damen Stan Pontoon 3011 Water Barge. They will immediately mobilise the vessel to supply fresh drinking water to areas of Morocco suffering from a long-lasting drought. Due to the contract’s urgent humanitarian aspect, Damen constructed the vessel within an extremely tight timeframe. With the pontoon fully operational less than six months after the order was placed, the team at Damen Shipyards Gorinchem, the Netherlands, have demonstrated their commitment to construct the vessel as swiftly as possible. The Royal Moroccan Navy can transfer the Stan Pontoon Water Barge between locations with either a tug or workboat. Furthermore, due to its narrow 11-metre beam, the smallest of harbours are also accessible. 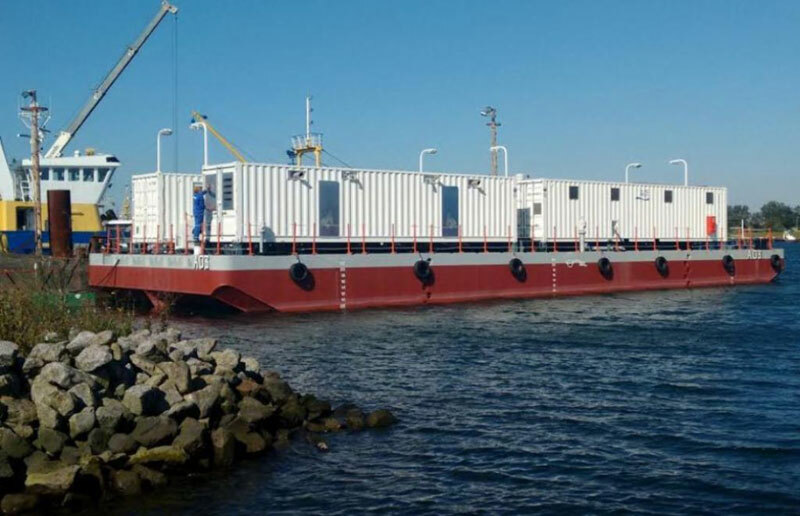 Needing only a supply of diesel to operate, the vessel is a self-sufficient water making platform. The design criteria of the onboard water making units reflect the intense climatic conditions of the Moroccan coastal region. The equipment is designed to handle maximum air temperatures of 45°C and seawater temperatures up to 35°C. The vessel’s design takes into account the efficiency of future service and maintenance issues. Most notably, the water makers installed on the Stan Pontoon Water Barge are larger versions of the same type that are found on the three Damen-built Moroccan naval frigates that entered service in 2011 and 2012. This will yield key advantages for the Royal Moroccan Navy due to the simplification of future maintenance and spare parts issues. In addition to the humanitarian aspect, the arrival of the vessel will also have a potential economic impact on the region. As the Moroccan agricultural industry begins to experience the damaging effects of the present drought conditions, a certain amount of the water may be used for irrigation purposes. Damen’s Stan Pontoons are known for their versatility, but the Stan Pontoon 3011 Water Barge represents the first time that the company has installed water making technology on one of its range. The vessel will provide a maximum water making capacity of 1,500m3 per day. While some fresh water can be stored on board, the majority will be pumped ashore via a pipeline. In a third recent construction contract with Damen Shipyards Group, the Royal Moroccan Navy has ordered five Interceptor 1503 vessels.